My educational and professional life is guided by the interest in the nature of matter on the nanoscopic scale, the world of electrons, atoms or molecules and their interaction and similarities with light. This fascination motivated me to study natural sciences and to specialize in the field of experimental quantum physics and optics. I believe most people are not aware how lucky we are to live in the exciting time to possess the necessary technology for the direct observation of quantum phenomenons. This allows beautiful experiments, such as the proof of particles showing typical wave behavior like diffraction and interference. These matter waves open up a large field in fundamental and applied physics. In my PhD-thesis: Optical Methods for Macromolecule Interferometry, we demonstrated that even the role of matter and light can be interchanged by interfering a matter wave of biomolecules on a standing laser light grating. For this reason, we developed optical methods for fluorescence detection of the molecules. Later in my career, being a postdoc, we studied the laser cooling and manipulation of ultracold quantum gases on a magnetic microchip and developed a method to detect single atoms by laser ionization of the atomic cloud. The Emmy Noether grant of the German Research Foundation allowed me to continue my scientific journey by founding my own research group: Quantum Electron- and Ion-Interferometry at the University of Tübingen. The focus is to understand the wave nature of charged particles and its applications. Our research led to the development of a novel sensor type and the fundamental investigation of the transition between the quantum and the classical world. 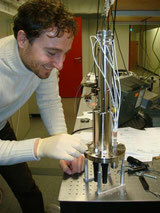 We also study the interaction between an electron wave and a superconductor. In 2017, I got the wonderful opportunity to work as a Visiting Scholar at Stanford University, USA, to develop new pulsed laser driven electron beam sources with interesting future applications in microscopy. Starting with April 2018, I got an exciting position at the UC Berkeley in the Berkeley Lab (Molecular Foundry), also to study novel electron beam emitters. Together with my colleagues we recently received a research grant from the Department of Energy for the development of superconducting coherent electron emitters and the application of quantum decoherence for novel devices in the field of quantum information science and electron microscopy. Besides my interests in quantum physics I also like to explore other fields of research and to search for applications in human sciences. One example is a cooperation with the Medical University of Graz, Austria. We studied new optical methods for pain analysis after knee surgery. But certainly, physics is not everything! I love to socialize, science fiction movies, traveling, hiking and do sports, such as skiing, squash, fitness training, and kite surfing.